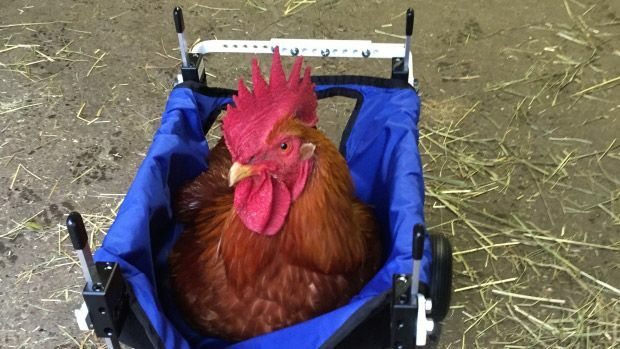 A rooster in a wheelchair? Yes, that’s right. Louise is no ordinary bird. The rooster was misnamed due to being falsely identified as a hen. sourceWhy does that matter? Because most baby roosters have no use in an industry that exploits chickens for their eggs in order to make money. Louise’s life would have been extinguished as a result, but he was misidentified as a hen instead. 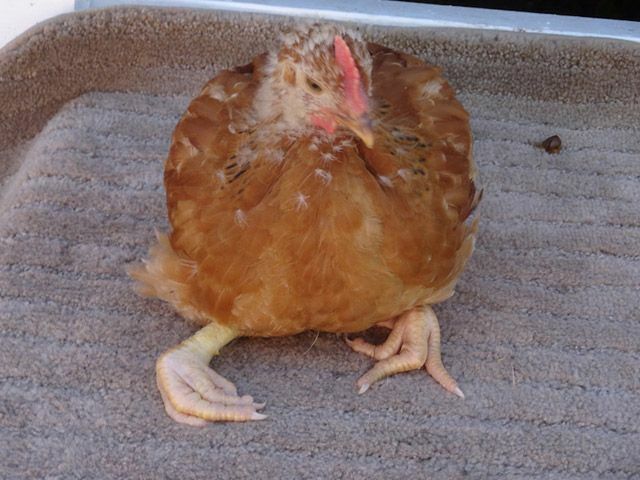 Louise also had deformed legs which prevented him from competing for food on the farm. Children living on the farm took a liking to him and sent him to Sali’s Farm in Langley, BC, Canada. SALI believes in the power of the human/animal bond to make the world a better place for people and animals. And that’s how Louise has helped other children who have suffered abuse and are at risk emotionally, psychologically and socially. It wasn’t easy starting off, having gone through many surgeries and x-rays along with orthopedic consultations to fix his legs, but nothing has helped so far. The wheelchair consists of soft material that supports the chest with the two legs going through holes at the bottom supported by a frame. There are four wheels attached allowing Louise to glide around with the grace of a swan. Sally’s farm is a nonprofit organization with the goal of helping children who have been victims of abuse, violence or neglect. This is done through cognitive, emotional and psychological connection, recognition and respect with another fellow animal like ourselves. 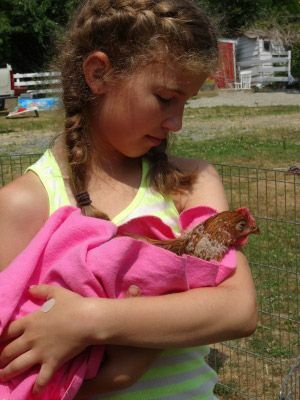 Children come to the farm and feel a special connection with the hardships that Louise has gone through, just as they have gone through. They can empathize with a fellow kin from the animal kingdom. Children hear about the sad story, and see the visible disability that Louise has in common, and this resonates deeply with them. They recognize the suffering of another just as they have suffered. They connect with another based on the recognition of mutual suffering, and associate, identify, connect and value the other as a fellow being who has suffered. Children who are exposed to violence are at an increased risk for various social and behavioural problems in adolescence and adulthood, including substance use, mental health problems, risky sexual behaviour, and violence. Children who grow up with violence indicate that watching one parent harm the other while being powerless to stop the abuse is a least as deleterious as being the victim oneself. Children in abusive homes often are witness to and even forced to participate in animal cruelty. Being forced to participate in the abuse of a pet is sometimes a parental requirement, one that likely puts the child on the road to becoming a violent perpetrator. Research shows that unless children affected by violence receive effective interventions, they are likely to become violent as adults or continue to be victims of violence. This becomes the generational cycle of violence. The overall well being of a community is related to the wellbeing of its residents, especially children. Deep down we know that nonhuman animals can think and feel in varying degrees. Those of us who have lived with them (dog, cat, pig, chicken, horse, cow, etc.) or experienced their life around our lives, get to know this reality no matter the denial about them even having psychological lives. Never underestimate the power of denial. Nonhuman animals might not have the degree of consciousness we do, but they have consciousness, and we can connect with them in psychological and emotional ways that matter to both individuals involved in the relationship. You can find videos of animal companions losing their care-taking human friend (or another fellow animal friend) and how they react after, just like how some human behavior changes after people lose a loved one. Just by being present and sensing the moods they are in—things most animals can do without any special training—these animals soothe their owner’s emotional upsets. They act as a constant friend and companion to their owners and, ultimately, help them cope with their emotional issues, which means a less difficult time coping with day-to-day issues. Do deny the connection human animals can make with nonhuman animals, or their psychological existence, is a fools errand. Some people get emotionally invested in other humans (like Debbie Reynolds who died after her daughter Carrie Fischer died), and some people get emotionally invested in nonhuman animals, who lose meaning and purpose to live if their emotional attachment that they derived value from is gone. It’s sad either way, but it shows that our fellow brethren in the animal kingdom are being highly undervalued in our current way of life where we do as we please to them, as if we own them and can engage in enslavement, exploitation, harm, and violence against these innocent beings who have a right to their own lives free from human corruption.